John and I never did see Le Conte’s Thrasher on our recent birding trip to the Mojave desert. While our guide, an enthusiastic young man with exhaustive information about avian life and an occasionally exhausting determination to find each promised species, may have been disappointed, we were not. Now several years deep into retirement, we have largely let go of the pressured demands of our earlier lives and are content to take in what we happen upon, enjoying these moments of discovery as if they were rare finds. We go slowly these days. Not because we have to. Straddling seventy, we are still agile and fit for fast-paced hikes. We go slowly because we can. We take our time looking, and, missing one airborne creature, we see another or catch the breeze blowing the desert shrubs, mimicking the movement of birds, so lovely against the stark backdrop of mountains and sand. Le Conte’s Thrasher is a trickster, our guide explained, a bird that hides right out in the open, staring at you as you search high and low to find him. Every part of him is drab like his surroundings. He may be sitting on a fallen Cholla branch or poised on the ground, waiting for his next meal, but he won’t tip his hand. We would be content to say we saw him out of the corner of an eye, dipping his curved bill into the ground to extract a juicy arthropod before heading home. Our guide, though, will have none of that. His credibility is at stake; he requires proof for each sighting, photos to show his peers. But John and I, upon returning to our nest back east, will take pleasure in the embellished stories we will recount. Sitting in our sunroom, with cats our only company, we will sip coffee in the morning, talk about our trip, and stretch the truth guiltlessly. In the days and months after I stopped working, I felt an urgency to find and begin what I would do next. After years in the pressure-cooker environment of an inner city mental health clinic, I couldn’t relax. When the end came, an end I chose, I grieved. With a swiftness that felt like the blow of a sword, I had lost my work friends, lost the patients whose life stories I could narrate like I could my own, lost the office space I had resided in and personalized, a space that even smelled like me. No more Hermes garden scents wafting out into the corridor. An empty expanse ahead, arid and unyielding. Without much thought, I plunged into work again, running a program for new mothers at a local medical clinic. I was on familiar ground, worrying about deadlines, about who would attend the groups I ran, who didn’t show up and why. When the funding was cut, I jumped into a program for women offenders facing life after prison. The commute was longer, and there was little clarity about my role. When the invitation to help out ended abruptly, I was hurt and relieved at the same time. I had been rushing to fill a hole, a sinkhole, that had opened up in my life. I realized I needed to slow down. In the desert, every vacated space is repurposed. A Cholla branch falls from the main plant and its holey remains sit like a skeleton in the sand. But inside the holes, there are beetles and spiders, life not visible that has made the interior its own. 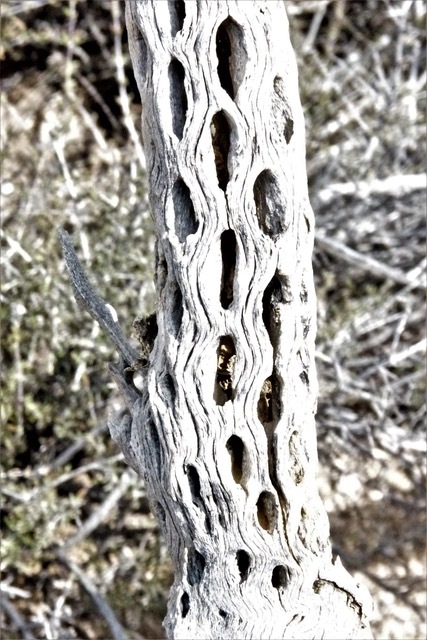 The holes in the living cacti are home to the woodpeckers who poke their heads out when we arrive as if to say no room here, who exit to sit atop their spiky dwellings, piercing the quiet with musical sounds. A small concavity will fill with water to hydrate anything that happens by. Holes are opportunities; empty means waiting to be filled. We gazed out on the vast terrain in front of us, awed by its hidden fecundity. We never saw the Gilded Flicker either, though we travelled hours to a distant desert location in search of him. Our guide tried in vain with bird call after bird call, hoping to coax a recalcitrant representative or two out of hiding. To his dismay, we only saw the Red Shafted Flickers whose aerial displays were enough for us, as they flew from one Joshua tree to the next, landing to nuzzle their mates, each small act of intimacy a sign of good things to come. Flickers are eye- catching birds with a slash of red on their faces, speckled breasts like Pollock paintings, and brilliant flashes of color under their wings and tails. John and I stood side by side, spellbound, as we watched them, our field glasses raised in synchronized tribute. Halfway across the desert in our rental car, John announced that we had no water. We both burst out laughing. Birds navigate seamlessly, sometimes thousands of miles, during migration. They know each rest stop and watering hole along the way. Here we were, traversing the Mojave, without a drop to drink. We had studied no maps and set out for our destination content to let our electronic navigator show us the shortest route, not realizing that it was also the driest one. It was forty-one miles to the next crossroad, where we might find a gas station with supplies. The air was cooling; the night was young. John pressed on the accelerator pedal and we took flight. Throughout her career as a clinical psychologist, Bonnie Chwast listened with great appreciation to the stories her patients told her. Now in retirement, she is finding time to tell some of her own.